Great Clover schools, great location and York County taxes are just three reasons to consider moving into one of the beautiful homes in The Landing on Lake Wylie. Located at Highway 49 near the intersection of Highway 274, the community is convenient to Charlotte, Rock Hill and Gastonia. Nearby Shoppes at the Landing offers retail, dining and business offices close to home. Walmart and Lowe’s Home Improvement are just up the road, and more dining and shopping options are further east on 49 toward the Buster Boyd Bridge. For Landing residents there is a covered picnic area, a pool and clubhouse and a playground. There are also 2 miles of paved walking trails throughout the wooded neighborhood. Developed by Crescent Communities and built by some of the country’s finest builders, such as Saussy Burbank, Shea Homes and David Weekly, The Landing has waterview, waterfront and interior homes available. There are also 4 sites for sale – 2 half-acre parcels and 2 three-quarter-acre sites still available ranging from $45,000 to $65,000. Home size requirements are minimum of 2,400 for a one-story ranch home or 2,600 for a two-story home. 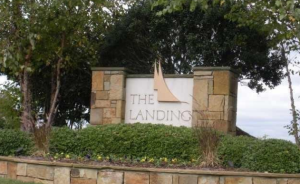 Currently, there are 8 homes for sale in The Landing, two of which are under contract. None of the homes listed are on waterfront lots. They range in size from 2,800 square feet to 4,700 square feet. An average of 1.1 homes sell per month in The Landing, which puts the current inventory at just under 7.5 months. This is more than the average for Lake Wylie and York County, which each has 6.9 months of inventory. The average price of a home in The Landing is $436,686 for the last 12 months. Expect to pay an average price per square foot of about $126 for a home in The Landing, which is the average during the last 12 months. Twelve homes sold during the last year in The Landing for an average of 98% of list price. The highest price of a home sold was $744,000 for a waterfront home and lowest was $323,000. You simply cannot go wrong living near the water, and The Landing is a fantastic, family-friendly choice!